The incredible turbine can generate the power up to 12 kW hour per day. It can power your house with almost free maintenance. The power generator is 100% waterproof. It is made up of aluminum and stainless steel to withstand the test of time. The machine is inspired by IKEA. It can be shipped anywhere in the box. The turbine can be easily assembled on the river bank. The installation of the River turbine requires three persons without the need of any experience. It is an unlimited and eco-friendly source of power. 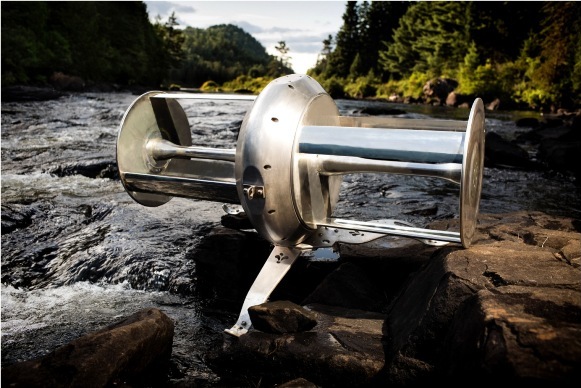 It is created by a Canadian company that makes green energy for your home using a river’s perpetual flow. It is not harmful to any of the aquatic life or no fish will get trapped or injured in the turbine. There’s a lot of hydrokinetic power in a moving mass of water. By placing a turbine in that liquid, the user can slow down the velocity of the fluid and convert it into mechanical energy. An electric generator and converter then change it into electricity. Using this, a user has a battery that can be charged 24 hours per day. It is considered as a neat solution that helps in reducing many of the downsides of gas generators like motor noise, the smell of gasoline, and round trips to the gas station.